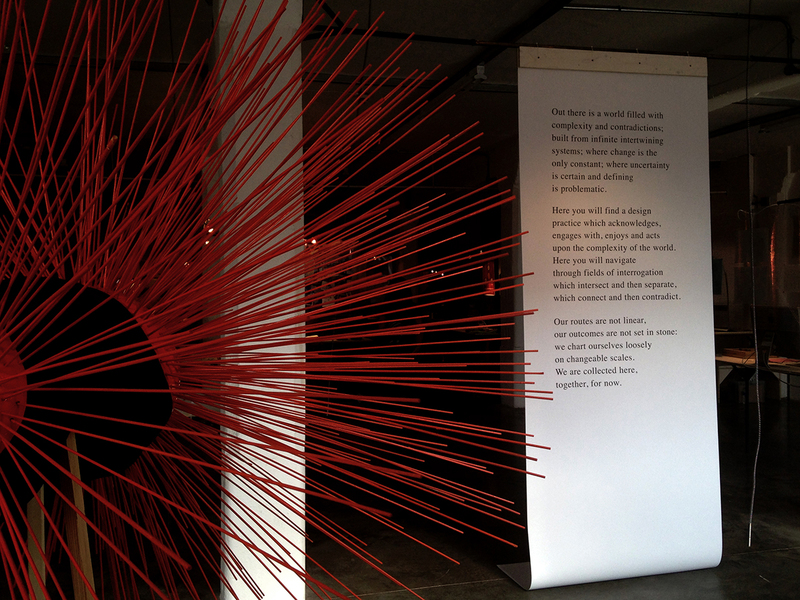 A year after my own degree show, I had the chance to visit the BA Design 3rd year students while they set up xv show. Thriving beyond the fatigue, they talk about their initial steps, their goals, their challenges and the way in which their designs interrogate our world. Some projects blur the lines in between the designer and the performer. Lukas Valiauga has explored the limits of personal identity in neo-capitalism. He has made himself a product for which every decision is a strategical formulation in between risk and potential. He explains that by using performance to look at his persona from a strategic point of view, everything in his life has become a prop. His amended suit and his raised shoes make him a puppet of what his investors want him to become. Even though his performance might seem extreme, he urges the audience to question “how is that different to any of us?” Lukas will be giving speeches to stakeholders during the show and you can buy shares of Luck Inc. to decide the future of his enterprise. Danae Papazymouri is challenging the agency of language to help us understand events. She has analysed language as a cultural construct in two situations: used by a funeral director and a life coach. In collaboration with them, she has created new structures that confront how we understand and use language. Danae’s project makes us question how rigid our frameworks for thought needs to be. Two years ago Charles Duffy showed me a sketch of a robotic hand explaining his idea for what would be his third year project when the time would arrive. He is now displaying a working prototype at xv show. 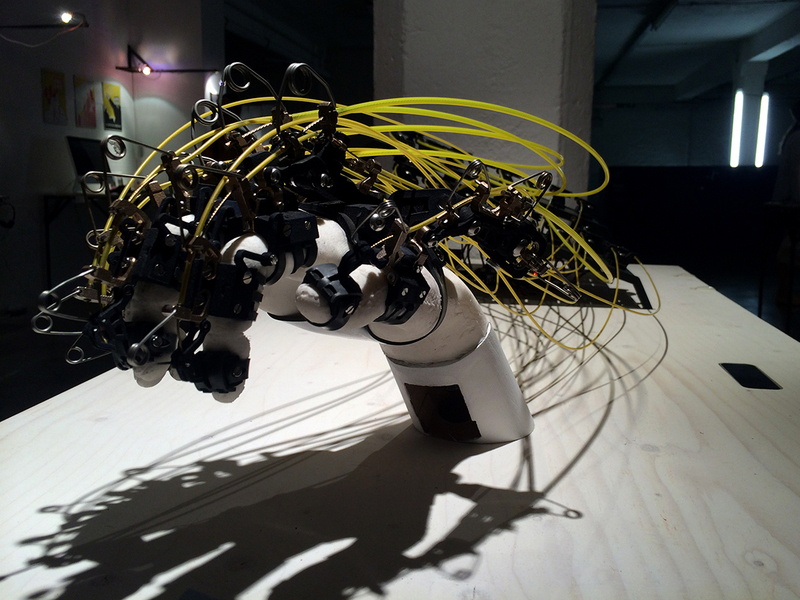 The learning hand, a robotic hand that mimics the movements of a human hand, has the potential to be used to experiment with muscular experience in neurological tests. Thomas Holloway didn’t follow a linear process. His project began looking at radical nationalist groups, then end up questioning what is it to be British. He has now created an alternative system to obtain British citizenship that engages the person with the land and the ruins of its nation in a physical process of pilgrimage and lawn mowing. William Gubbins started with escapism and gathering materials to build architectures for humans to be attuned with nature. His process was lead by material exploration. He realised that our romanticised idea of nature isn’t about being in consonance with the country, but about our senses and a primal experience of the self. William has created a series of helmets with a thousand spikes that gather sound and deprive vision. People experiencing these helmets focus on their aural senses to understand their environment and generate empathy with those who surround them. At the show you can experience them yourself inside an architectural soundscape. The students have found themselves performing, becoming experts in linguistics, finding a common rational between technology and choreography, engaging with extremists. They have encountered experts and users in different fields and adapted their designer mindset to be able to communicate with them, while keeping an analytical perspective. As their manifesto proclaims, at xv show “you will navigate through fields of interrogation, which intersect and then separate, which connect and then contradict”. Clara Nissim will question your perception of history, while Daniel Nasr prompts you to support refugees with community based education in order to preserve their culture, their knowledge and their future. Robert Fitzgerald will ask you to stop the end of the world through honest poetry, while Fraser Pearston will encourage you to interact with our discarded material world. Each of them will challenge your understanding of the complexity of the world. Find them while they are collected at Old Truman Brewery, together, for 3 days until Monday 8th June.